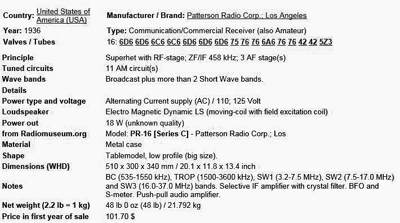 Patterson Radio Corp., also known as Patterson Radio Company: – Trade names Patterson, Sierra, Supreme. Emmitt Patterson started the Patterson Electric in 1919. The chief engineer was Ray Gudie who also designed the Breting receivers. 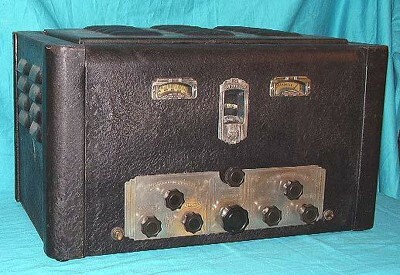 Patterson introduced their 16 tube receiver in 1935. Engineer Ray Gudie left Patterson during the design of the PR-12, over a wage dispute. Emmitt Patterson tried engineering the new PR-12 but soon discovered he was completely out of his element. Patterson hired Karl Pierson in 1934 to complete the PR-12 but Pierson took one look at it and scraped the whole project. Though the PR-12 appeared in a few advertisements in late 1934, it was never in production. Pierson was instrumental in the design of the PR-15 and PR-16 receivers. The Patterson receivers were high end receivers with high tube counts, chrome chassis’, crystal filters and many other features not available on Hallicrafters and National radios of the same vintage. All the Patterson chassis’ were manufactured in the Gillfillan plants. 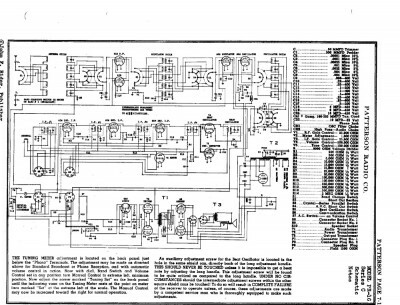 Pierson designed the PR-16 in just a few weeks as the “new” Patterson receiver. The PR-16 featured parallel RF amplifier tubes (2-6D6s) which, in theory, increased the gain and reduced thermal noise. It also allowed the receiver to be advertised as having two RF amplifiers, even though there was only one set of RF coils per band and the receiver is essentially a single pre-selection frontend. The incredible audio section has three stages of Push-Pull audio using a 6A6 dual triode, two 76 triodes and two 42 output tubes supplying 18 watts of low distortion audio power. The BFO adjustment is a “swing-arm” lever accessed under the cabinet lid. Chrome chassis, band-in-use dial masking, illuminated R-meter, crystal filter, two-speed tuning – all for the low price of US $101.70, (1936 price.) Even though the parallel RF amplifiers are unconventional and no other manufacturers ever tried to market the configuration – the PR-16C is a good performer with good sensitivity, nice mechanical band-spread and powerhouse audio. 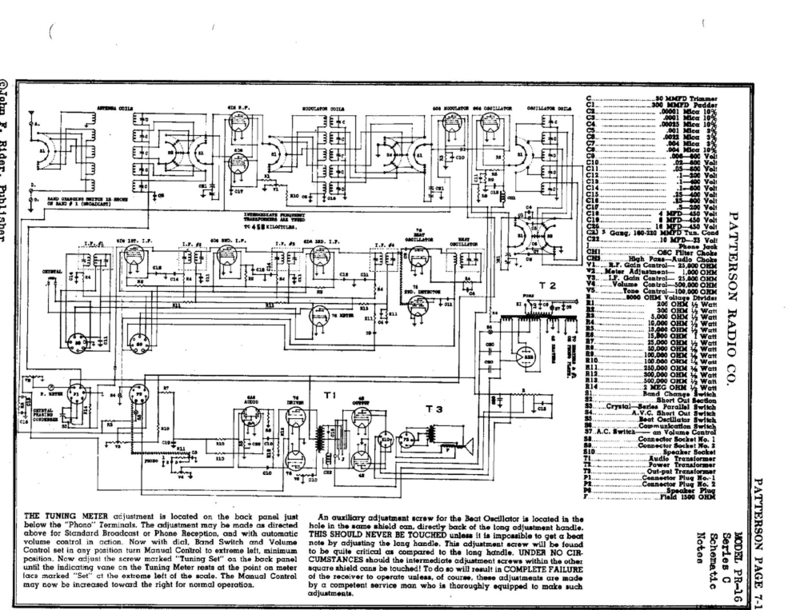 Karl Pierson left Patterson in 1937, purchasing all of Patterson’s communications receiver manufacturing business. Pierson continued to build the Patterson PR-15 under the Pierson-Delane name. Emmitt Patterson went out of business in 1939. These were a highly sought after receivers in their day by DXers and Ham radio operators alike. At least one is known to have come to NZ. I have a personal interest in Patterson receivers but unfortunately have no knowledge of the receiver you are referring to. Does anyone have info on a Paterson aviation radio designed for Amelia Earhart in 1937? Said to be a special PR-13 lightened for aircraft use with a remote panel for three channels. : 500 , 6100 & 7000 Freq. .